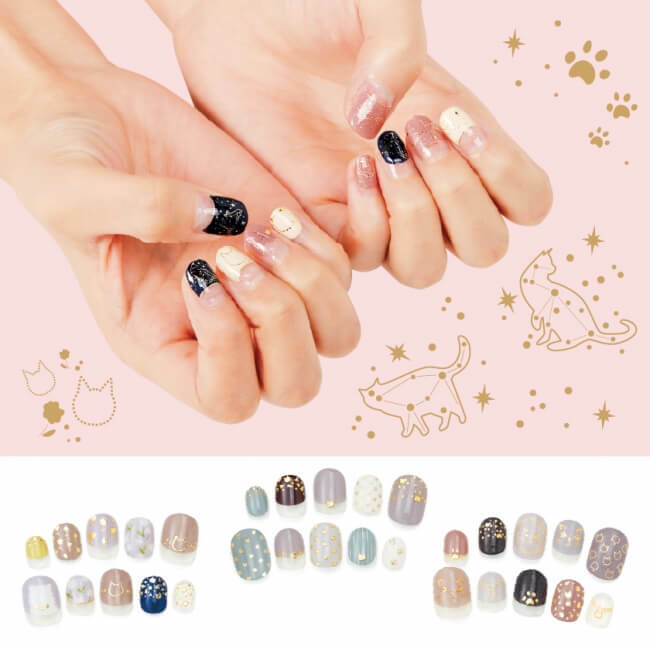 Felissimo Neko-bu™ released their new ‘Cat Nail Seals’ on their website on October 22. The nails come with a thick and glossy transparent gel that you simply apply to stick the nails on which also give them three-dimensionality. They are perfect for people who are in a rush, want to make their nails stylish but aren’t sure how, those who don’t have time to go to a nail salon, and those who have an interest in nail art but it troublesome. There are 4 designs to choose from. Cat & Constellations: A girly colour combination of pink and white. Cat Emblem: A good choice to match light skin tones with luxurious pink beige and greys. Also great for parties. Cat and Cat Powder: A flowery design of the cat powder plant. Perfect for when you need to look flashy. Cat Dots: A mix of greyish mint and brown to create a mildly cool look. These high quality nail ‘seals’ have been carefully designed so they can be applied to a variety of nail shapes. They are made in such a way that it is difficult to end up with creases and wrinkles in the seals so you can apply them effortlessly. If you add a top coat of gel they’ll be even longer-lasting. Each order comes with a set of two so you can make both hands symmetrical or asymmetrical. There are so many combinations you can make even with the same set. The cat motifs and vibrant colours are ideal for a whole range of settings, whether it’s an everyday look or you’re off to a party. They’re sure to be noticed and crop up in conversation when gathered around people. They also make for a perfect gift for cat lovers. As always with Felissimo Neko-bu products, part of the price of these false nails goes towards numerous causes including shelter for animals with no owners and for helping find them owners, as well as aiding towards getting stray cats off the street to avoid overpopulation, and for protecting animals during times of disaster. *The number of times they can be used depends on nail size. *May not be applicable with certain nail shapes. Cannot be returned after use. *Please cease use after 5 days of use. ・1 of 4 designs shipped per month in rotation.